I’m so glad I spent some time at home this afternoon. 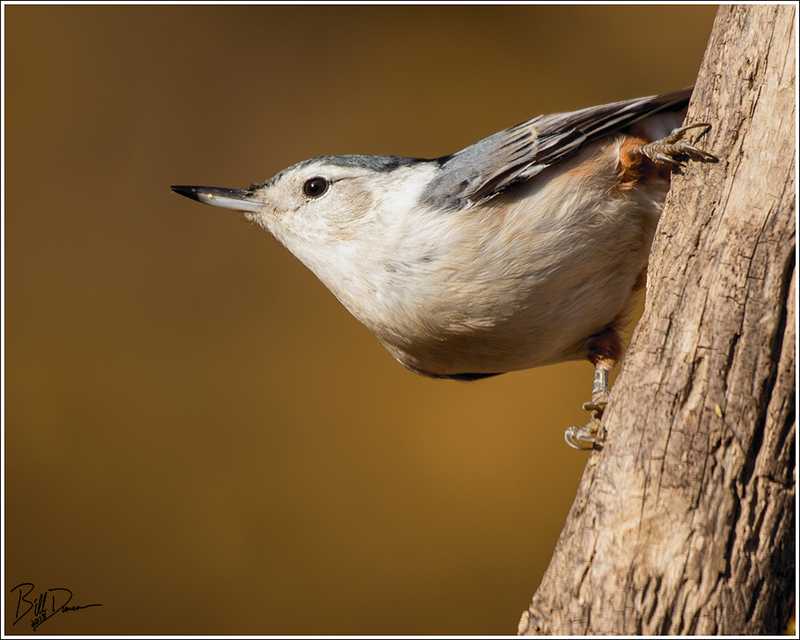 This gave me the opportunity to find the first Red-breasted Nuthatch that I have found visiting our backyard feeders. 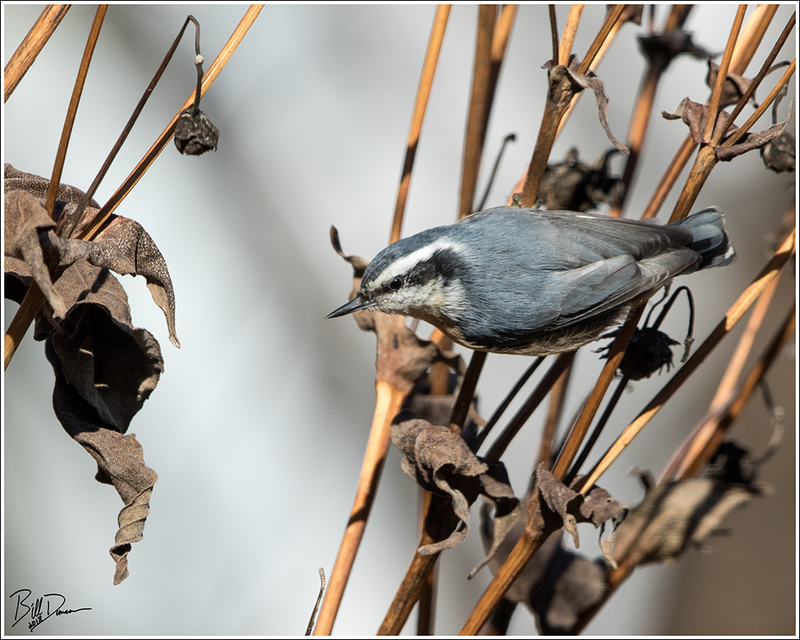 I so wanted to some how tell this little one that I would have seed available all winter long as it consistently went back and forth from the big oak to the feeder, each time carrying a sunflower seed to hide in the bark. I am pretty certain that this bird visited the feeder more than 50 times in the couple hours I watched. I have been given a lot inspiration lately by a number of Facebook friends to photograph the great birds that visit our feeders, or to put it another way, make these models work for their supper. 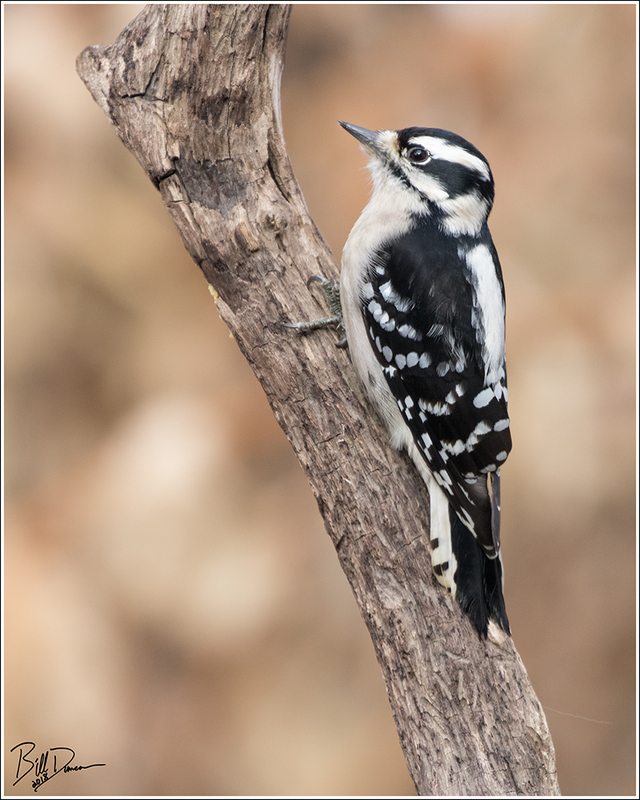 On a recent birding trip, Sarah and I collected some great drift wood that I turned into horizontal and vertical branches in the backyard, not too far from the feeders and our sun-porch. I drilled a few extra holes towards the rear of some of these to act as unseen cavities to place my homemade bark butter. 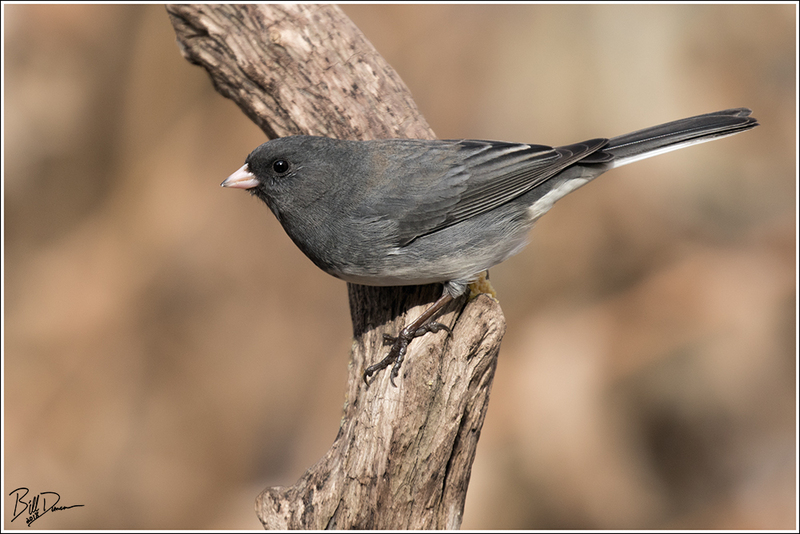 It only took the Juncos a couple of hours to find their favorite food. These guys go crazy trying to figure out how to get to this stuff. I made sure to place a few feeding spots near horizontal perches that they could access without too much difficulty as they cannot grasp vertical perches very well. 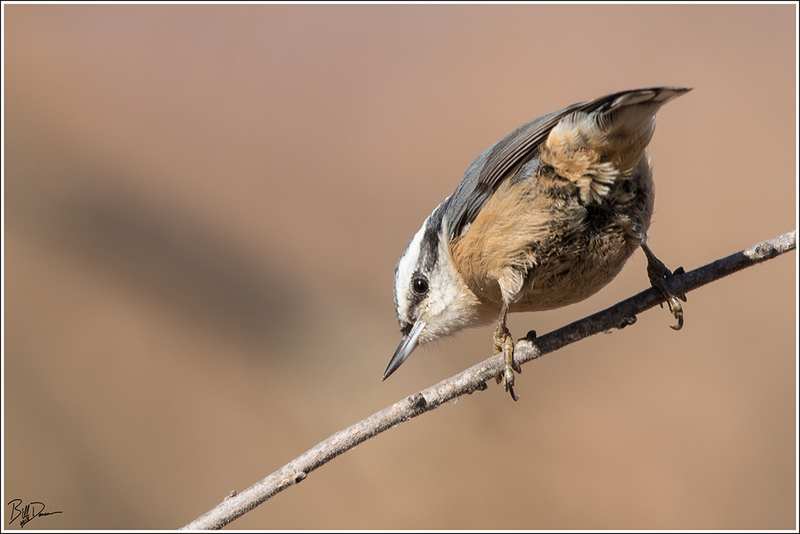 These guys are so tame that they were my primary subjects, other species being a little more timid to visit the close perches and seed deposits that I sat close to. For a first attempt, I’m pretty pleased. These were shot hand-held in mixed lighting with my 100-400 mm lens and I shot through the not-so clean windows of the sun-porch. I tried sitting behind the open windows, but this must have made me much more conspicuous. I sat for an hour or more with few birds coming in to feed. 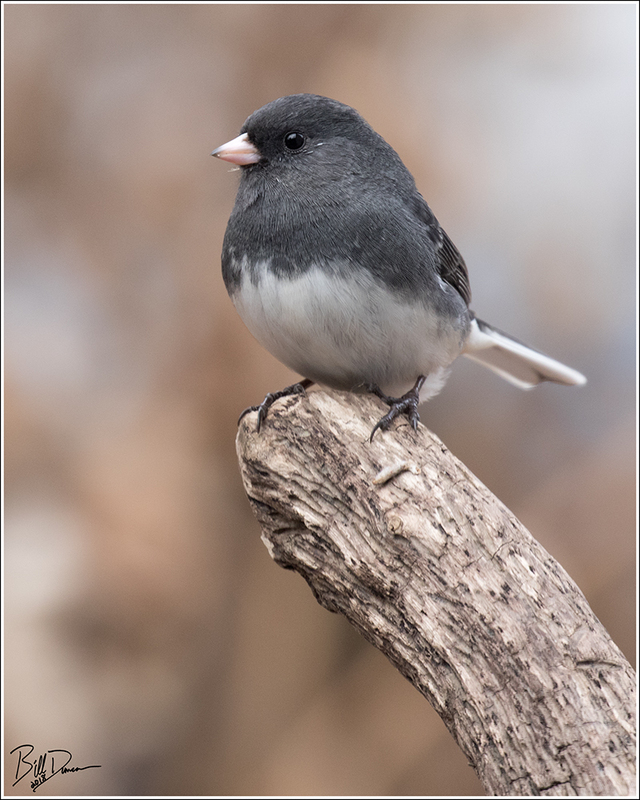 Within seconds of me closing the windows, the Juncos came to the feeding stations. I’m a little concerned that my resident Downy Woodpeckers might have a little too much of the rich food I am providing. They now have access to the peanut and tree nuts in the no-mess mix I provide, beef tallow suet blocks, and now the bark butter. But, I suppose it would take a lot for a wild bird to over indulge. Anyone who feeds their wild birds and has an interest and access to photography should give this a try. I’m looking forward to more cold mornings spent outside trying my hand at this.